Through the years a number of options were put on the table for such an enterprise, a canal through the Darien, another, a canal through Mexico and one other through Nicaragua. 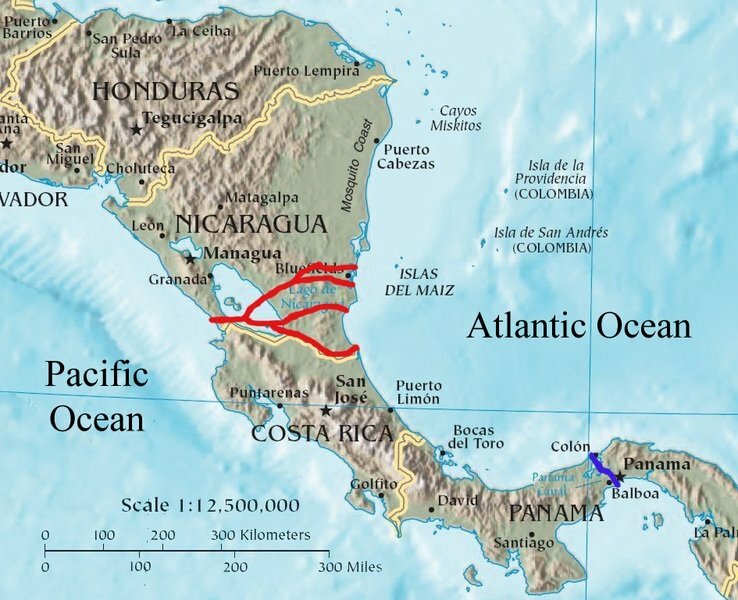 When the americans came to finish the canal that the french started in Panama, they were studying the Nicaraguan option by using lake Nicaragua to help shorten distances. Today the chinese are working to construct a canal through Nicaragua. Some studies have been made, some land has been cleared, some other land is being purchased and being prepared to create a new canal which will even wider, deeper and longer than the new Panama Canal which was put to work just a few days ago. Preliminary studies put the bill of the new Nicaraguan canal at fifty billion dollars and five years of back breaking work. If a new canal is indeed built, it will be good for business. Competion brings better services and lower prices to consumers. The future of the Nicaraguan canal is still murky and uncertain but if built, it will benefit and widen the possibilities of world wide commerce for years to come.